Michael Murphy has been a musician for more than 30 years and has traveled from coast to coast sharing his songs. 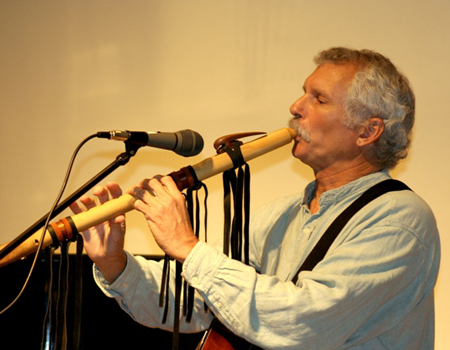 A student of R. Carlos Nakai, Michael can take you back to America before Columbus, and return you to the here and now with the soothing sounds of Native American Flute music. He can tailor his shows to be educational, about the flute origins, native culture, how to play, or it can be an enjoyable concert performance. Grade schools to university campuses, coffee shops to concert halls have all been his stage, his CDs are played across the country, to Europe and Japan. The presentation can go anywhere from a series of short clinics to a 90-minute concert, or combine them to fit your needs. Technical Requirements: Artist has a small sound system, but for large auditoriums or big outdoor shows, lighting and sound equipment may be needed.